Similar to other world languages, Russian has 7 days of the week, 2 of which are called “Выходными” [Vykhadnye] Weekend, but the rest of the days when people work, study, or are busy doing some other things are called “Будние дни” [Budnie dni] weekdays or “Будни” [Budni]. Every work day [rah-BOH-cheey dyehn’] has its own original and interesting name which appeared in the past and still exists nowadays. In ancient times, in Russia the week used to have a completely different name – “Седмица” [sedmitsa], which is originated from the word “семь” [sem’] seven, but only one day of the week -воскресенье (Sunday) was called “неделя” [nee-DYEH-lyah] week , as it was a custom to do nothing (НЕ ДЕЛать )on this day. Therefore, the word “неделя” originated from this verb. After Russia had become a Christian state, and Russians started to celebrate Easter, this day was called “воскресенье” which means “raising” , “resurrection”. The days were counted from Sunday, therefore “понедельник” [puh-nee-DYEHL’-neek]Monday was the first day after “ничего не делать”. The second day after Sunday was “вторник” [FTOHR-neek] Tuesday. The word originated from the Old-Slavic word which means “second”. Wednesday got its name because it is in the “в середине” [siridina] middle of the week or from the word “сердце”[sertse] heart. Thursday is the fourth day after Sunday and it is originated from the word “четыре” [chityri] four. Friday is the fifth day after Sunday and it is originated from the word “пять” [pyat’] five. The name “субботa” originated from the Jewish word “sabbath” which means “покой” [pakoj] rest. What prepositions do Russians use with the names of the days of the week? Russians usually use the preposition “В”/”ON” when they want to say that they are going to do something or to go somewhere on this day. For example: Я пойду в кино в воскресенье, а на работу – в понедельник. [Ya pajdu f kino f vaskrisen’e, a na rabotu – v panidel’nik] I will go to the cinema on Sunday, but to work – on Monday. It should be mentioned that all days of the week are used with the preposition “В”, except Tuesday. This day of the week is used with the preposition “Во”, for example: Во вторник будет жарко [Fa ftornik budet zharka] It is going to be hot on Tuesday. Prepositions “к” or “ко” (for Tuesday) are also used with the days of the week. К субботе я приготовлю кексы [K subote ya prigatovlyu kyeksi] I am going to make cupcakes by Saturday. 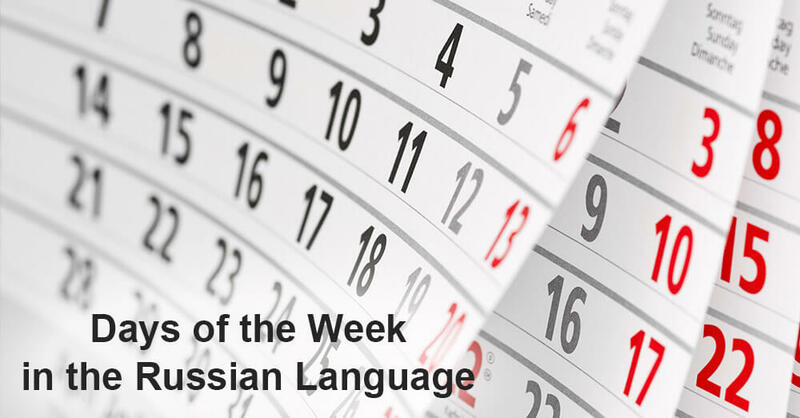 We hope you have found this article interesting and now you know the names and origin of the days of the week in the Russian language. Russian language is fun to learn!